If a printer is filled with a desire to improve his output, such a collection will be of help, not merely in the production of individual pieces of work, but in broadening and improving the mental outlook which he brings to his work as a whole. If a printer does not care how his work looks, this Library will not only be wasted on him but its implications will make him uncomfortable. The Daniel Berkeley Updike Collection was opened to the public in 1937, and Updike intended it to be a source of learning and inspiration to printers with a desire to elevate their craft through the study of the history of printing. The annual Updike Prize for Student Type Design was created in the same spirit, rewarding undergraduate and graduate students who make use of the Updike Collection in their creation of a new typeface or typeface family. Applicants must conduct at least one on-site visit to use type specimens in the Updike Collection within 18 months of the application deadline, and they must be enrolled in an undergraduate or graduate program during the time of their visit. Only one typeface family may be submitted per year, per entrant; re-submissions, especially of further refined typefaces, are encouraged. Applicants will retain full intellectual rights to the typefaces they submit for the competition. One use license will be granted to Providence Public Library for promotional purposes. A type specimen with a representative character set, submitted as a pdf of up to four pages and designed to be printed at either 11"x17" or 8.5”x11”. A 250-500 word essay describing the typeface as well as the designer’s use of the Updike Collection and the role it played in the development of the typeface. First Prize includes $500. Up to two runner-up prizes may also be awarded, and all finalists will receive gift certificates to our sponsor, Paperworks. Names of the finalists will be recorded on Providence Public Library's website, their specimen broadsides will be displayed in an exhibition at the library, and their typefaces will be featured in future Updike Prize promotional material. Copies of the specimen broadsides will also be added to the Updike Collection. Thanks to Paperworks and RISD Graphic Design for generously sponsoring the Updike Prize. The annual Updike Prize rewards undergraduate and graduate type designers whose work has been influenced by materials in the Updike Collection at Providence Public Library. Whether students choose to revive a historic typeface or to create a new typeface inspired by an earlier design, applications are judged on the quality of the specimen, the quality of the typeface submitted and how creatively and thoughtfully it interprets a historical model. Join us to celebrate the 2018 Updike Prize winner! 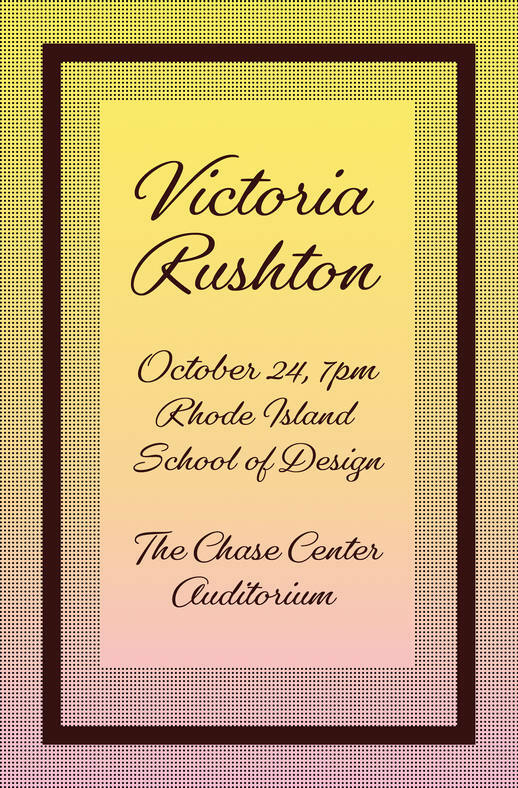 The evening features the awarding of our 2018 Updike Prize; a talk by our guest speaker, type and lettering designer Victoria Rushton; and a lively conversation between Victoria and our 2018 winner and other Updike Prize candidates, moderated by industrial designer and RISD Industrial Design Department Senior Critic Matthew Bird. 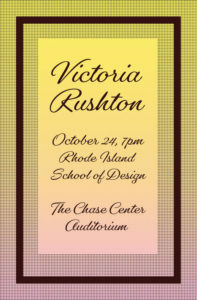 A type and lettering designer, Rushton graduated with a BFA in Illustration from RISD, and was trained to design typefaces at Font Bureau. She produces custom type for clients and distributes original fonts through her own foundry on TypeNetwork. She’s spoken at Typographics NYC and the Type Directors Club, taught type design at MICA Graduate Studies and SVA, and is a contributor to Alphabettes and Typographica. Free and open to the public, reservations requested, click here to reserve your seats! The Updike Prize is co-sponsored by Paperworks and the RISD Graphic Design Department. Poster designed by Erica Carras. Examples of a few historic type specimens from the Updike Collection are available at our TypeSampling blog. Contemporary type specimens are available online from sources like I Love Typography's "This Week in Fonts" posts.